The Exclusive Option Leather Shift Boot with Deviated Stitching (4.1A) features a rich leather surface with matching or contrasting stitching. This rare shift boot trim was an exclusive option that was made available by the factory only on the most exclusive models. This part matches the rest of the deviating stitching that your car has. This ofter overlooked option ties the shift boot with the rest of the interior stitching, accenting the lower center console shift knob area. 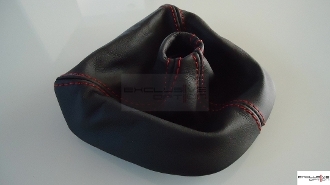 Don't forget to get the matching the Leather E-brake with Deviated Stitching to complete the set.